Synopsis : Clary Fray just wishes that her life would go back to normal. But what's normal when you're a demon-slaying Shadowhunter, your mother is in a magically induced coma, and you can suddenly see Downworlders like werewolves, vampires, and faeries?. . .Clary's only chance to help her mother is to track down rogue Shadowhunter Valentine. . . To complicate matters, someone in New York City is murdering Downworlder children. Ahh, The Mortal Instruments Series . . . we meet again. As I have already said, I am not the biggest fan of this series. The plot isn't terrible, but some of the writing drives me up the wall. Still I keep reading them because I hate stopping in the middle of things and I did get City of Glass signed so I might as well stick around. The first book in the Mortal Instruments, City of Bones, is about Clary Fray's discovery of the secret Shadowhunter world and the larger than life characters that inhabit it. City of Ashes is about the trial and strains on relationships created in City of Bones. Although most of the relationships have only existed for like 3 weeks tops. Anyway, there is a lot of drama going on.The characters are all trying to discover how they relate to each other and if that isn't enough there are a few new characters added to the mix. Oh, and there is also a big bad plot that kind of takes a back seat. But the overly purple prose still glared at me. The weak points were the multiple side stories and characters. It was like the new characters introduced didn't connect or add to the plot in anyway. I mean they go and visit fairies, hang out with some werewolves yet they don't offer anything to the actual plot, except maybe to explain stuff. 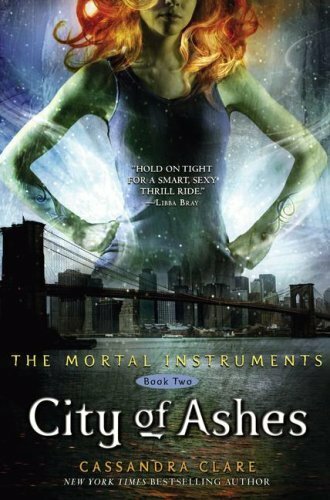 City of Ashes did not really seem to propel the series, except for two plots points mentioned in passing for added for suspense. The novel was more like a vehicle to show how evil Valentine is. City of Bones and City of Ashes could have been merged and edited into one book. As for the cliff hanger ending ? I didn't hate it. I just hope City of Glass takes more than 2 weeks later. Maybe ? I only read the first book, and I had a hard time getting through it. In the books defence I had just finished Mockingjay. I really want to continue the series.